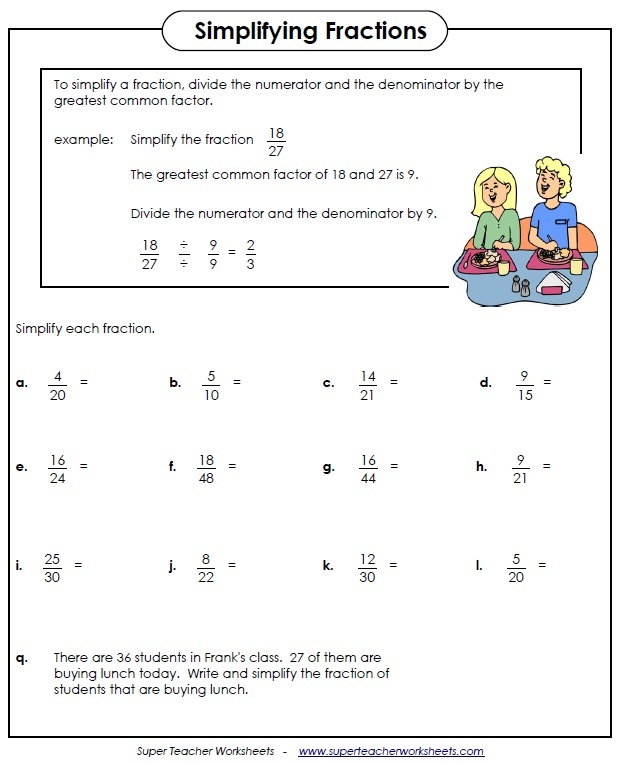 Advanced fraction worksheets include equivalent fractions, ordering fractions, comparing fractions and "fractions of a number." For basic fraction worksheets, please visit this page Fraction Worksheets (Basic). The fraction worksheets on this page are aligned to the Common Core Standards. To see Common Core information, select the common core icon located below each worksheet's description. Find pairs of fractions that are equivalent in this memory match game. Fill in the missing fraction parts to make equivalent fractions. Find equivalent fractions. 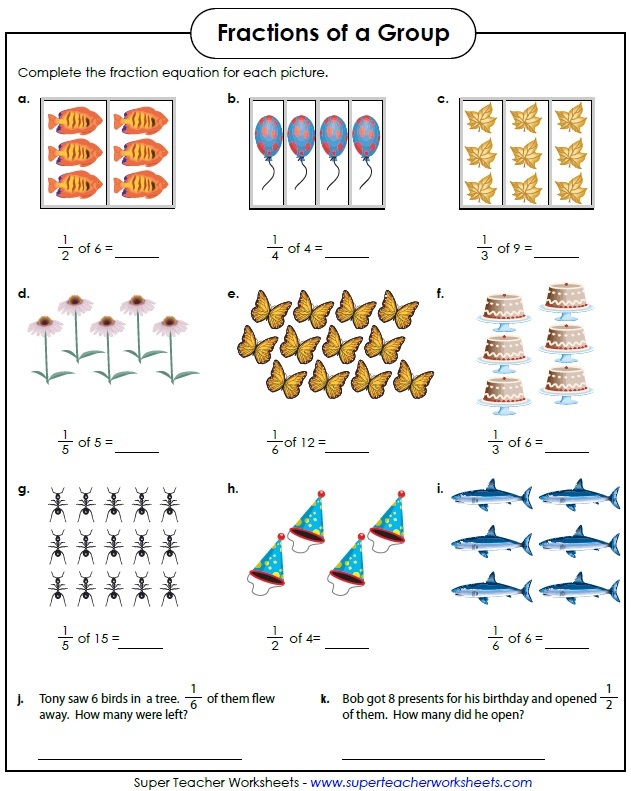 This worksheet includes many graphical questions that help students to visualize the concept. Determine the correct fraction amounts to balance the scales. Match the fractions on the left with the equivalent fractions on the right. At the bottom, circle three fractions that are equal. This worksheet includes colorful circle illustrations. This bookmark shows equivalent fractions, in order, from least to greatest. Reduce (simplify) each fraction into its lowest terms. Another worksheet on simplifying or reducing fractions. This worksheet has 5 parts. First, reduce fractions into simplest form. Then circle the fractions that are in simplest form. After that, answer two word problems. Then tell whether each equation is true or false. This is a set of 30 task cards on reducing fractions into simplest form. Each of these word problems has a fraction answer that needs to be reduced, and written in simplest form. Write the fractions that correspond with the letters shown on the number lines. Count by halves. Great for helping students learn to measure inches on a ruler. Count by fourths. Excellent for helping students learn to measure to the nearest quarter inch on a ruler. Place the fraction cards in order from least to greatest. The dancing pigs have fractions on them. Cut out the pigs and place them in order from least to greatest. Compare the pairs of fractions using the greater than, less than, or equal to signs. Color the fraction circle pictures according to the instructions, then determine which is greater. These word problems require students to compare two fractions and determine which is greater. Here's a set of 30 task cards. Each card has two fractions on it. Students compare using the mathematical symbols <, >, and =. Write the improper fraction for each mixed number. This worksheet also includes an improper fraction word problem. 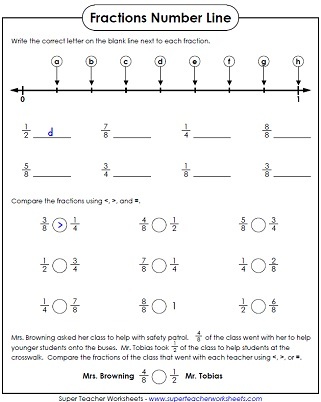 Worksheets for teaching basic fraction recognition skills and fraction concepts. Worksheets for teaching students about mixed number concepts. Add and Subtract Fractions with same and different denominators; Also add and subtract mixed numbers. We also have printable worksheets for teaching and reviewing reciprocal fractions.